A sad day. Baby Cassowary has been cast adrift by his father to face the world on his own. He has spent the day wandering around and calling with a high-pitched whistle that his father previously responded to. Now the rest of (his or her) life will be spent largely alone in the rainforest looking for fruits and small organisms for food. If it's lucky and avoids being attacked by dogs or pigs and does not venture on to the highway, the Cassowary can expect to live a relatively long life. Females have been known to take as many as three mates in succession, and produce more than one clutch of eggs per year of which 2-3 will hatch. After egglaying is complete, she leaves him to incubate and rear the chicks. He is in full charge for many months. 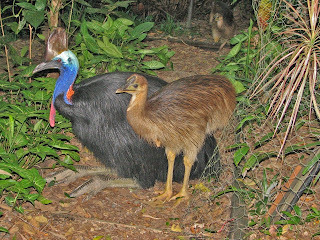 Once he runs off the young Cassowaries, in the manner of domestic chickens, it takes about 2-3 years for the chick to mature. 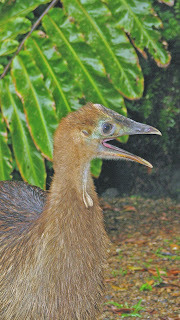 During this time, the young Cassowary may venture in other Cassowary's territories and be run off. Eventually it will establish its own territory and establish routes where preferred trees are fruiting or there are other reliable food sources.